Blue colors are associated with water, natural fish habitat. Orange buttons and elements stimulate buyers' mind activity and help them be more decisive. Attractive banners make good promotion to store products. 'Featured items' look perfectly over white background. It is difficult to miss newsletter subscription form due to the large fonts and some color emphasis. Black footer looks very contrasting. Remember, your path to eCommerce will be much easier and quicker with this template. WordPress Multilingual layouts can be interpreted in a variety of languages without difficulty, thereby helping you to build a multi-lingual web property. Making it possible to translate the site into different foreign languages WPML plugin lets you expand the client database with foreign users. Responsive design renders a web site page same exact nicely on any existing screen size. Portfolio website is a type of website that enables displaying various items (services, works of art, products, etc). It's actually an excellent website design approach for artistic individuals, just like photographers, performers, designers, etc. This is a free open-source WP toolkit that allows web developers to design themes much faster and more correctly. This type of framework offers countless solutions and fits the needs of equally software engineers and persons without having any particular coding skills. Search Engine Optimized templates make it possible to raise your internet page rank in search end results. Bootstrap is really a very well-liked framework, which makes the work with HTML, Cascading stylesheet and also JS easier. It was produced as the tool to build a responsive design, yet over time it added loads of additional efficiency. Bootstrap is highly adjustable for any customization. It's easy to work with, has a superb grid system and large features quantity. Can I get the extended license for some other pricing than the half of the initial Travel WooCommerce theme price? No. The price for purchasing license for a single Travel WooCommerce theme is the half of the template unique price. Can I put low resolution thumbnails of Fishing Supplies WooCommerce design themes on my website for my clients to choose designs? What is Developers License for WooCommerce design theme for Sport Center ? If you purchase a Developer's license, you are granted a non-exclusive permission to use the WooCommerce design theme for Sport Center on up to 5 domains for projects belonging to either you or your client. I would like to make payment for WooCommerce design for Sports Store by company check. Is that possible? Please use Skrill payment option. They accept payments by check.You can place an order for WooCommerce design for Sports Store on the site under the name of the company and choose Skrill merchant system for making payment from the company's account. To initiate bank transfer, please create an account here - www.skrill.com, add the number of your bank account and verify it. After that, you can place an order on our website and choose Skrill on checkout page. When the payment is made, the product will be sent to your e-mail along with the invoice under the name of your company. Can I customize the WooCommerce template for Outdoors & Travel if that's required by application settings? Yes, you can customize the WooCommerce template for Outdoors & Travel code, graphics, fonts to any extent needed. Can I use graphics from Sport Kit WooCommerce design theme I purchased for use in printing? Yes, it's not prohibited to use the Sport Kit WooCommerce design theme graphics for printed material, but the resolution of the templates graphics ( except for logo templates) is not enough for printing. Can I put a line at the bottom (or any other spot) of my new product "Website development by Company name" after purchasing Sports WooCommerce theme? Yes, you can place a note at the bottom (or any other spot) of my product "Website development by Company name". Nevertheless, you cannot place "Website design by Company name"while using one of Sports WooCommerce theme. Is there any return policy for Outdoors& Travel WooCommerce design themes? Requests for a refund are accepted at www.template-help.com/tickets within the period of 2 weeks after the order of Sports WordPress WooCommerce theme is placed. You should accompany this request with detailed and grounded reasons why you apply for a refund. Please make sure your request does not contradict the terms and conditions specified in the policy. A refund is issued to you upon receipt of a Waiver of Copyright signed by you. Can I integrate the WordPress WooCommerce theme for Outdoors Sports and Travels with third-party software or applications for development of my new products? No, you cannot get the developers license for development of WordPress WooCommerce theme for Outdoors Sports and Travels or other products. Can I resell the customized WooCommerce template for Sport Blog? No, you cannot resell the customized WooCommerce template for Sport Blog as a template but you may sell it as a project to your client (see paragraph 1 ONE TIME USAGE LICENSE for more details). Can I resell the WooCommerce themes for Sport Kit I bought the extended license for? No, you cannot resell the WooCommerce themes for Sport Kit as is. You can only sell them as the integral part of your new product. Can I resell the customized Sport Gear WordPress WooCommerce template? Yes, you can redistribute Sport Gear WordPress WooCommerce template under the terms of the GPL as well. What is the difference between unique and non-unique Fishing and Hunting WooCommerce template purchase? Non-unique purchase:Non-exclusive purchase means that other people can buy the Fishing and Hunting WooCommerce template you have chosen some time later.Unique purchase:Exclusive purchase guarantees that you are the last person to buy this template. After an exclusive purchase occurs the template is being permanently removed from the sales directory and will never be available to other customers again. Only you and people who bought the template before you will own it. Can I resell the WooCommerce template for Sport Newspaper as is? No, you cannot resell the WooCommerce template for Sport Newspaper as is. What will I see instead of the images after installation of the WooCommerce design theme for Sports Reports? After WooCommerce design theme for Sports Reports installation you will see blurred images included for demo purposes only. What is a one time usage license for a WooCommerce theme for Travel? When you buy the WooCommerce theme for Travel at usual price you automatically get the one time usage license. It enables you to use each individual product on a single website only, belonging to either you or your client. You have to purchase the same template again if you plan to use the same design in connection with another or other projects. When passing files to your client please delete the template files from your computer. What is a unique purchase license for Fish Hunting WooCommerce design theme? 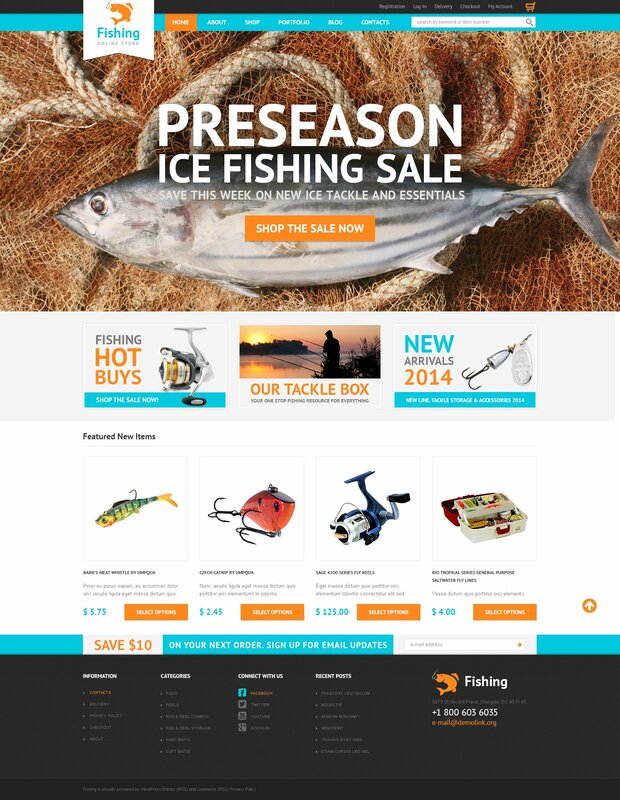 If you purchase the product at a â€˜Unique price' it guarantees that you are the first and the last person to buy this Fish Hunting WooCommerce design theme from us. It means that this template has not been sold before and you become an owner of a unique design. After this kind of purchase the template is being permanently removed from our sales directory and is never available to other customers again. The unique purchase license allows you to develop the unlimited number of projects based on this template, but the template should be customized differently for every project. Are there any discounts if I'm buying over 10, 20, 30 or more WooCommerce design for Fishing Accessories? Please email to marketing@templatemonster.com with your inquiries about Sport WooCommerce templates. How can I modify WooCommerce design theme for Sports News Website to suit my particular website? Please visit our Online Help Center to obtain detailed instructions on editing WooCommerce design theme for Sports News Website. Are images included in the WooCommerce design themes for Sport Magazine released under GPLv3.0 license? In the WooCommerce design themes for Sport Magazine released under GNU GPL v3.0 images are not included and are used for demo purposes only. Will the WooCommerce theme for Live Scores Website be deleted from TemplateMonster database? No, the WooCommerce theme for Live Scores Website will not be deleted from TemplateMonster database. What is a buyout purchase license for Fishing Store WooCommerce design theme? If you purchase the product at a â€˜Buyout price' it guarantees that you are the last person to buy this template from us. It means that this Fishing Store WooCommerce design theme may have been sold before a couple of times (see â€˜Downloads' number in item's properties) but only you and people who bought the template before you will own it. After this kind of purchase the template is being permanently removed from our sales directory and is never available to other customers again. The buyout purchase license allows you to develop the unlimited number of projects based on this template, but the template should be customized differently for every project. Can I resell Fishing and Hunting WooCommerce templates I bought the developers license for? You cannot resell the customized WordPress WooCommerce template for Extreme Sports as a template, but you may sell it as a project to your client. I have customized the WooCommerce design for Sport Teams and would like to protect my content by copyright, can I place Copyright, Mycompanyname.com? After WooCommerce design for Sport Teams purchase you can put your copyright to the template. But you cannot place a line at the bottom (or any other spot) of the customized project saying "Website design by Company name". Nevertheless, you can place "Customized by Company name". I like the image from the Sports WooCommerce theme and would like to use it for my advertising campaign, can you send me this image in a higher resolution? No, we can't provide image in higher size or resolution rather than it is on the Sports WooCommerce theme. We recommend looking for professional images on online photo resources. Super strona , pomoc na najwyższym poziomie . Obsługa klienta super . Strona łatwa w obsłudze . Zakup szybki bez żadnych problem&oacute;w . Kontakt po zakupie błyskawiczny . Pierwszy m&oacute;j zakup ale na pewno nie ostatni Polecam wszystkim .